Around 75% of Americans experience anxiety every day. The stress and worry can cause an uptight and unhappy life. During menopause, the increased stress can be closely linked to decreased estrogen levels in the body, which trigger stress response functions, worsening your feelings. In order to get a hold of your symptoms, it is important to ensure that you are getting enough key vitamins for mood. Learn which are most vital, as well as a couple of herbal remedies to reclaim your peace of mind. B12 is one of the most important vitamins for anxiety and depression, and a lack of it can impair cognitive function. Individuals with depression who have a B12 deficiency have been shown to benefit from supplementation. Further, vitamin B6 is extremely important for the production of “happy brain chemicals”, such as dopamine and serotonin. 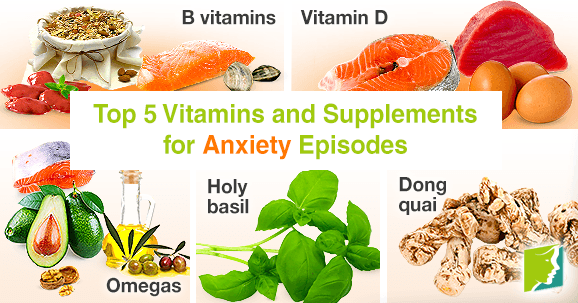 A B-complex multivitamin may help relieve symptoms of anxiety episodes. Research has found that many people are deficient in this essential vitamin, and the majority of those who get tested have low levels - sometimes dangerously so. In particular, studies have found that individuals with depression tend to have low levels of this fat soluble vitamin, found in eggs and fatty fish. While your body can produce its own vitamin D with enough sun exposure, many doctors recommend that patients take a daily supplement until their levels are where they should be. Once optimal levels are achieved, individuals may notice a shift in their mood and coping abilities. Omega-3 and omega-6 fatty acids, which the body cannot manufacture, are essential for proper cognitive functioning. Those who experience depression often have a deficiency of omega-3. Studies have found that individuals notice markedly less anxiety and frustration within three weeks of taking omega supplements, typically at 1,500 mg daily. Ask your doctor if he or she can test you for omega-3 or 6 deficiency to find out which you may need to increase your intake of. This antioxidant-rich leaf, part of the mint family, has been used for millennia in India to restore peaceful functioning of the body, mind, and spirit. Studies have found that 1,200 mg daily can strongly calm your nerves without any reported side effects. You can also get to the root of menopausal hormonal instability by taking phytoestrogenic herbal supplements. Dong quai, also contains plant compounds that are received by estrogen receptors in the body and activate them when estrogen is not present. This can help regulate brain chemistry to minimize the amount of stress felt. Women all over the world are embracing the positive effects that dong quai has not only on their stress levels, but many other menopausal woes as well. B vitamins, vitamin D, and omega fatty acids work harmoniously in the body to provide you with sustained feelings of relaxation and mental clarity. Whether through some dietary changes or a supplement, ensure that you are getting enough so as to improve your mentality. Your doctor can let you know if supplements like sedative holy basil or estrogen-boosting dong quai can also help. Follow the link for further information on how to treat anxiety during menopause effectively.